Today was the Wayra Madrid Demo Day – an opportunity for its first startup class to pitch their projects in front of a selected audience of entrepreneurs and mentors, and the culmination of the acceleration process they have been going through for the last few months. As you may remember, Wayra is the name of the accelerators that Spanish telecommunications giant Telefónica has opened all around the world since 2011. While it all started in Latin America, the one-year old Wayra now also has operations across Europe, including in Telefónica’s home country. In Madrid, which was its first European base, its modern academy occupies one full floor of Telefónica’s historic building, with views over the famous Gran Via. According to its global director Gonzalo Martin-Villa, “Wayra is much more than an accelerator – it is a global entrepreneurship network.” This was a hint at one of the program’s main selling point for startups, the chance it gives them to collaborate with similar teams in other countries and learn from their experience. 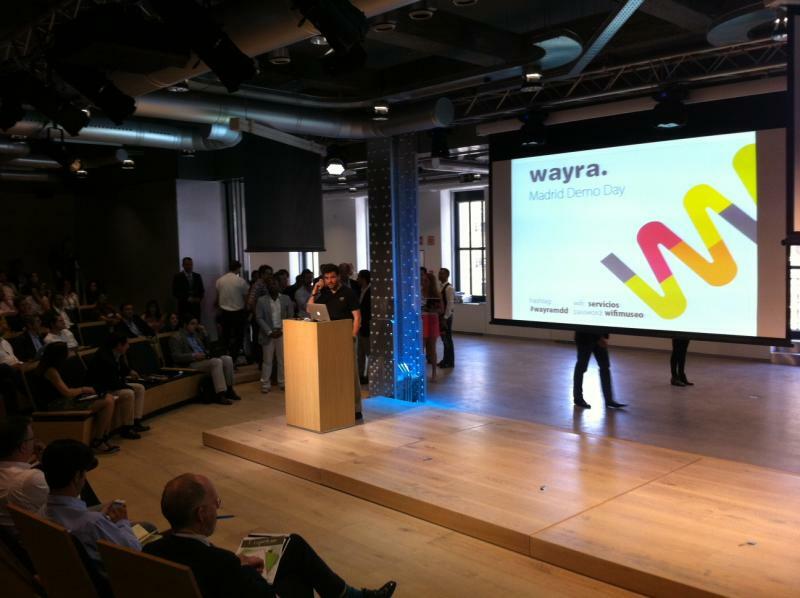 For Telefónica, today’s event was also the opportunity to showcase the value it has added to Wayra’s shortlisted teams. In exchange for an average equity stake of 10%, “entrepreneurs worked with a list of mentors which feature some of the biggest names in the Spanish entrepreneurship space,” said the head of Wayra Spain, Gary Stewart. As a matter of fact, each startup was introduced by one or two of their mentors, which included seasoned entrepreneurs and investors such as Bernhard Niesner, who founded the language startup Busuu, and François Derbaix, who recently sold his company Toprural to HomeAway for a reported amount of €14 million. Mentors aside, most of the room was filled with investors – not only from Spain, but also from other countries such as the UK and Israel, which led the event to be fully conducted in English. While it is always hard to gauge feedback in real time, the audience seemed quite enthusiastic about most of the projects, and it will be interesting to see how many investments will take place as a result of this demo day. From our perspective, one of the most interesting points was to see how much progress the teams had made over a short period of time. We had first reported on them last February, and while those which then were our main bets did very well today, others also managed to considerably improve their business proposal, sometimes thanks to a pivot. Coquétame is a personal stylist service with a B2B and B2B2C business model. In its pitch, its CEO emphasized the success of its beta testing phase in increasing conversion rates. According to Juan Hurtado Bravo, this helped the startup start negotiations with major fashion retail players such as Mango and Inditex, ahead of its beta launch next December. Clipyoo is an online video stock agency, where producers can buy existing HD footage to include in their content at a low cost. While there are large competitors in this field, David de Miguel pointed out pricing as one of Clipyoo’s main differentials. Here’s its video presentation. Impok‘s CEO David Moreno delivered a highly energetic pitch, in which he explained the advantages of Impok’s personal investing management dashboard over banks and traditional brokers. According to Moreno, who already sold one company to Telefónica, Impok can bring transparency and disintermediation to this segment – while making a process in the making. Miramusei is an app that hopes to enhance museum visits. Already available in the App Store for $1.99, it also considers offering a white label solution to interested museums. Evomote slightly pivoted during Wayra’s program – and it seems it was for the best. While its initial product focused on controlling TVs, its new approach hopes to solve the content discovery problem. Despite this change, technology is still at his core, Besides the app its team demoed on stage, Evomote will also offer an ‘Evobox’ as well as an API for operators’ set-top boxes. Emtrics lets companies of all sizes collect instant customer feedback at their point of sale locations. It has already gained traction and revenues with the first clients it enlisted over the last few months, and it was also the solution Wayra chose to collect comments on each of today’s pitches. While it currently relies QR codes, its co-founder Iñigo Serrano made it clear that it may consider other technologies in the future. Sezion‘s recently launched iPhone app Sezion Studio lets amateur musicians collaborate to create songs. With that in mind, you won’t be surprised that its demo involved an electric guitar, which scored major points with the audience. Mirubee is a social platform for energy saving, which lets users easily find out how much electricity each of their appliances is consuming – and reduce their bill and carbon footprint accordingly. Valioo went through the biggest pivot of all Wayra’s teams, and introduced a brand new product on stage, the book recommendation platform Gus with a social component, which is due to launch on mobile devices over the next few weeks. However, its founder Thibaut Deleval points out that Gus still uses Valioo’s core platform, and could be transposed to other verticals. We’ll publish individual articles about the most interesting startups over the next few days, so stay tuned for additional coverage!